After the 2012 season, I recapped a few Marlins highlights with the “Flying Fish Awards.” I did not do so in 2013 because it was too dismal of a season on which to reflect. But a bounce-back year in 2014 got my hopes up, so here are the highlights from an exciting year in south Florida baseball. 7.28.14: 7-6 win over Washington. Some of the most exciting games of the Marlins’ season came against Washington, including a 15-7 Miami win and a Jordan Zimmermann no-hitter in the final series of the year. 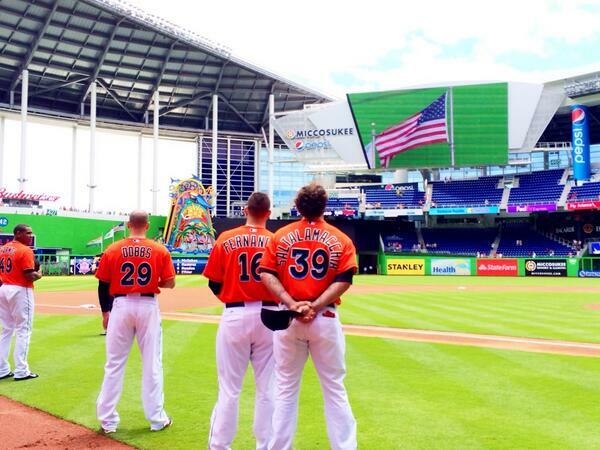 But there was no better illustration of the Marlins’ resilience than this victory over the Nationals. Battling back from 6-0 with a battered bullpen, Miami waited until the late innings to spark the offense, but scored four in the ninth to cap a wild comeback. 6.20.14 by Marcell Ozuna. This video shows two plays that Ozuna made late in a game against the Mets to ensure the Marlins’ victory. The final one particularly, a laser on the fly from deep in left field to seal a game-ending double play, was one of the best defensive plays I’d ever seen an outfielder make. 5.21.14 by Giancarlo Stanton. The other side of outfield defense is of course tracking and catching. As far as timeliness goes, there was no better catch than this sensational dive by Stanton against the Phillies with the bases loaded and two outs in the middle innings. Batted by a left-handed hitter, the ball was surely tailing towards center field, away from Stanton. He dove completely off the ground and fully extended to make the play. Perfection! 8.11.14 by Giancarlo Stanton. Surprised? There’s a reason Stanton received the largest contract in the history of professional sports after this season. He was the National League’s home run leader, and best overall hitter. In this August game against St. Louis, he belted two homers and made a fantastic diving catch in right field. You can watch his highlights from that game on this post from On Cloud Conine. Watch where the hit lands, and then notice as it bounces up and hits the glass panels behind the concourse in left-center field. Had those been opened, the ball would have bounced clear out of the stadium. Here’s another home run that put Stanton on SportsCenter. It came on Memorial Day at Nationals Park against then-hot Tanner Roark. Stanton mis-hit the ball, he got under it too much. It still traveled 447 feet, off the back wall of Washington’s batters’ eye. 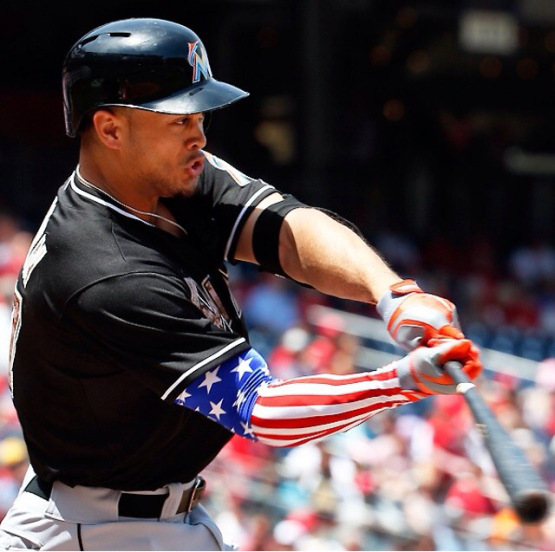 Most of the publicity from this bomb came in response to Giancarlo’s patriotic arm sleeve.